Free-ranging goats on Arapawa Island, at the northern end of the South Island. As animal breeders have constantly sought to improve their livestock, some of the original breeds have dwindled to low numbers and even died out. In Britain alone over twenty breeds of farm animals have become extinct since 1900. Worldwide, the rate of loss has been estimated as about one breed per week, so the genetic diversity of livestock is rapidly becoming reduced. A common breed can become rare and then extinct in a very short time unless someone is caring for it. This has happened to sheep, cattle, goats, pigs, poultry and horses. They may have been superseded by today’s fashions, but they still represent unique “genetic packages” for use again some time in the future. Market fashions change. Lean sheep are now favoured over fat, and goats are now valuable to many farmers who used to shoot them as pests. Rare breeds often retain desirable characteristics that can be incorporated in new improved breeds of livestock. Genetic engineering is rapidly revolutionising breeding work but it still needs the appropriate genes on which to draw. Rare and unusual breeds provide material for research on the evolution of domestic characteristics. Breeds that have lived in isolation for some time illustrate how animals change when they run wild, and in New Zealand they illustrate aspects of our colonising history. 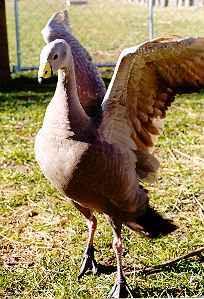 The Cape Barren Goose is a rare breed from across the Tasman. Many people find unusual animals attractive to look at, to breed, to keep or to exchange with friends. On their own they can do only so much. Getting organized can help them develop contacts, share experience, get advice, build up their knowledge and avoid mistakes and losses. As a group, lay people, scientists and managers can do much more than individuals working alone. And they can develop a common voice in the interests of endangered livestock. To catalogue the holdings and locations of rare and unusual livestock (see Rare Breeds Registry). To foster official and amateur efforts to preserve rare breeds, special breeding groups, and feral types. 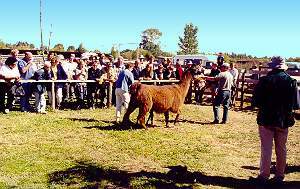 To publicize livestock genetic conservation at meetings and shows, and in the popular press. To maintain contact with overseas societies and international agencies. To organize rescue and breeding programmes. The Society has established a Rare Breeds Gene Bank to help retain valuable genetic material by cryopreservation. 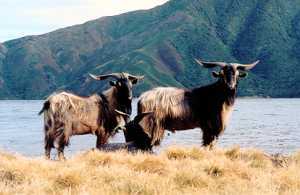 © All New Zealand Rare Breeds Website material is Copyright – in the first instance to the writer or photographer concerned, secondly to the compilers of this website and thirdly to the Rare Breeds Conservation Society of New Zealand Incorporated. All Rights Reserved World Wide. See Website Information for details on this website. 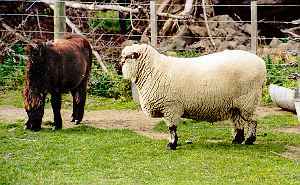 A small Miniature Horse stands beside a large Shropshire Sheep on Canterbury property. Free Buy and Sell advertisements on Webmart. Free listings in the Breeders Directory. A quarterly magazine, Rare Breeds NewZ. 33% discount on webpage/website design and hosting. Access to Rare Breeds Registry. Member's discount when registering animals. Advice on obtaining and looking after Rare Breeds of livestock. Contact with others with similar aims and interests. You will be helping to conserve genetic diversity in livestock. See Join the Rare Breeds Society for details about joining on line or by post. See our Links page for links to other Rare Breeds organizations, specialist groups, allied interest groups, and personal advertising/information pages; or the Breeders Directory for links to personal advertising and information sites and pages.